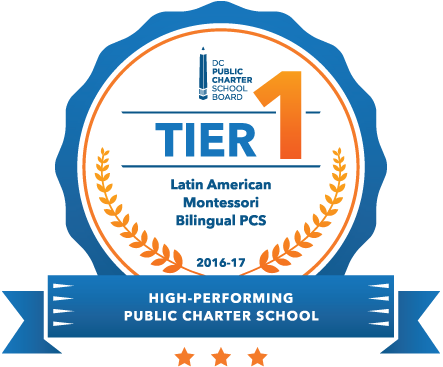 Washington, DC - November 8, 2017 – For the Sixth Year, the Latin American Montessori Bilingual Public Charter School (LAMB) achieved Tier 1 Status based on the DC Public Charter School Board’s (PCSB) rankings, and this year LAMB was the highest ranked early childhood/elementary public charter school in Washington, D.C. In addition, LAMB was rated as one of the highest performing DC Public Charter Schools (based on overall score) and has consistently been assessed Tier 1 since 2012. This Tier 1 ranking, which indicates high standards of performance, is based on the results of the School Quality Report, the PCSB’s annual tool for assessing and monitoring charter school performance. Each year, DC PCSB evaluates the performance of every public charter school in the District. These evaluations are compiled into reports, which are used to rate schools into Tiers 1, 2 or 3, with 1 being the best. This allows students and families to rate the quality of the school’s achievement compared with other public charter schools across Washington, DC. Although every public charter school is unique, these reports focus on common metrics to rate and evaluate all schools on an equal footing. “Kudos to the entire LAMB Family: students, staff, parents and partners. This achievement underscores the importance of coming together to support our students and further our mission of fostering a learning environment that promotes a lifetime of learning,” said Diane Cottman, LAMB’s Executive Director. A school’s score is based on a numerous factors, including student progress as measured by the average growth in state test scores (PARCC) of individual students from one year to the next, the percentage of students who scored College and Career Ready or Approaching on the PARCC, school attendance rates, and school re-enrollment rates. LAMB’s 2017 overall percentage is 87.7%, up 4.4% from last year. LAMB is a dual language immersion public charter school, which serves children from preschool to grade 5, with facilities in Wards 4 and 5 in the District of Columbia. LAMB’s mission is to foster bilingualism in a self-directed learning environment in which children build a foundation of knowledge essential for a lifetime of learning. Below is page 14, written by our own Principal Cristina! LAMB Achieves Tier 1 Status! LAMB has achieved Tier 1 status for a fifth year based on the DC Public Charter School Board 2016 School Quality Report. Congratulations to students and staff for their hard work! Happy International Day of Peace 2016! LAMB will be working with a new food service vendor this school year. NSLP Solutions will be providing all meals at LAMB including a fruit/salad bar. NSLP Solutions believes in feeding children healthy, nutritious, locally sourced foods. Their mission is to feed every child in the nation the same way we feed our own children. For more information, visit www.nslpsolutions.com. LAMB estará trabajando con un nuevo proveedor de alimentos este año escolar. NSLP Soluciones proporcionará todas las comidas en LAMB incluyendo frutas /ensalada tipo buffet. NSLP Soluciones tiene como meta alimentar a todos los niños con alimentos sanos, nutritivos y locales. Su misión es alimentar a todos los niños de la nación de la misma manera que alimentamos a nuestros propios hijos. Para obtener más información, visite www.nslpsolutions.com. Washington, DC – March 7, 2016 – Three teams from the Latin American Montessori Bilingual Public Charter School (LAMB) competed in Maryland’s West Central Regional Destination Imagination Tournament on February 27, 2016. One team won first place in their division, as well as the Spirit of DI award. The two other LAMB teams won second place in their divisions. This is the third year that LAMB students have participated in Destination Imagination (DI), a non-profit organization whose mission is to develop opportunities that inspire the global community of learners to utilize diverse approaches in applying 21st century skills and creativity. In the DI program, teams choose one of seven challenges, then over the course of the school year they work together to create and develop their solutions. The Super Flying Shadow Guys will be moving on to the Maryland State DI Tournament, scheduled for Saturday, April 9 at the University of Maryland Baltimore County. For more details related to the elements of each challenge, please read the brief description of each challenge. Design and build a vehicle able to carry at least one team member across the presentation site multiple times. Change the vehicle propulsion system and the vehicle movement method during the presentation. Create and present a story about change. The story will include a change in a character. Research the many ways that camouflage is used by organisms in nature. Showcase camouflage research in the visible appearance of an organism. Create and present a story with a plot twist that is caused by the use of camouflage. Apply camouflage methods to an original, team-designed and created set piece or prop. Present a mystery story set on Earth in a team-chosen time period before 1990. Discover, live on stage, which of the three suspect characters is responsible for the mystery. Include a TechniClue that helps solve the mystery. Present in the style of traverse staging. PARCC? What does it mean? Below you'll find the PARCC document that was presented during the PTO meeting on Tuesday, January 12 during the PTO Quarterly meeting. Each year around this time, I try to find a quiet spot to sit and listen to the kaleidoscope of thoughts and feelings I have running through my mind and heart. Foremost is a sense of gratitude for all that each and every one of you do to make LAMB an educational home that not only provides high quality academics, but builds a community of learners that celebrates the uniqueness of the individual child and his/her ability to develop their whole selves. When I walk around LAMB with visitors, without exception, the consensus is LAMB is a special place. There are lots of smiles and quiet and raucous activity. When you walk into an elementary classroom, frequently a student comes over and introduces him or herself and offers you something to drink. Other students are working on chromebooks, involved in animated conversations, or working with their teacher guides individually and/or in small groups. In a primary classroom, there are children snacking, teachers and students working on mats on the floor or small tables, an easel being splattered with paint by the next great artist or a student comforting a peer in crisis. You may not know that the headphones are really noise cancelers for the child who is better able to concentrate with fewer audio distractions. The adult and student in the corner are a wonderful example of how inclusion works well for some students with special needs; and the lunch bunch is both a reward and motivation for students who need it. One hears Spanish and English and students demonstrate through their actions that they understand what is being said. You can see diversity in height, gender, color, and weight; but you cannot see at-risk, special needs, socio-economic status, single or coupled parents, homeless or homeowners. There are no labels nor price tags giving visual cues for the cost of learning. But imagine, two teachers in every classroom, clean safe facilities, high quality staff, music and art, summer school, extended learning day, year-round professional development, camping trips and field trips all around the DC metropolitan area, ALL come at a premium cost. More than 800 families entered LAMB’s lottery this year. We had fewer than 50 new slots available. We need to increase our enrollment to educate more District children. We must address the persistent gap in academic achievement among those with few to no risk factors and those who struggle with multiple risks. We must replace the loss of District support of summer school with donor dollars, in order to lessen the “brain-drain” that occurs when children are not enrolled in school; and we must strengthen our core programming and support services. We are proud of our accomplishments and YOU ARE KEY TO OUR STUDENTS’ SUCCESS. We are grateful and thank you for all you have done with and for us in the past. We still need your help. Por favor, remember LAMB for your year-end tax-deductible giving. You may give any many ways. You can send us a check made out to LAMB PCS or click here to make a tax-deductible donation. LAMB’s tax identification number is 52-2356681. And, please make time to embrace loved ones and share a smile with a stranger. Small and large acts of kindness are the greatest gifts we can share with humanity. New parents are strongly encouraged to attend this important session scheduled for Thursday, August 27th from 6:00 – 7:30 pm at the Missouri Avenue Facility, 1375 Missouri Avenue, NW, Washington DC, 20011. Due to inclement weather, the Open House on 3/5 has been rescheduled to Thursday, March 12, at 10:00 a.m. at the Missouri Avenue Facility. LAMB is happy to announce its status of Tier 1 School for the 4th year in a row! LAMB staff at DCACPS Awards. On Thursday, May 8, 2014 the DC Association of Chartered Public Schools (DCACPS) presented awards to two LAMB staff members. At their annual STARS Tribute, DCACPS presented Diane Cottman, Executive Director of the Latin American Montessori Bilingual Public Charter School (LAMB), with an award for Most Valuable Administrator. LAMB Principal Cristina Encinas was given the award for Most Outstanding Principal. For more information about this program, contact Kioma Alfred at 202-726-6200 or via email at Kioma@lambpcs.org. The LAMB PTO needs 3 to 5 volunteers once a week from 2:30 – 4:30pm to make and sell popcorn. Popcorn Day is on Wednesdays at Missouri and Fridays at Taylor. To volunteer at Missouri, sign up at http://tinyurl.com/popcorn-missouri or contact: Oscar Rojas at oskrjas@hotmail.com. To volunteer at Taylor, sign up at http://tinyurl.com/popcorn-taylor or contact Miguel Rosario cayeycatering@yahoo.com. Come join us for a night of family fun. LAMB families are invited to the Missouri Avenue Facility on Friday, February 22, 6-8 PM, to play their favorite board games. A spaghetti dinner will be provided by the school. Bring your favorite game to share. RSVP’s are appreciated so we can better plan the night. Send an email to Teresa@lambpcs.org if your family is planning to attend. LAMB will be participating in Club Leo from Scholastic Book Clubs. This is a great opportunity for parents to get their children Spanish books for their home libraries. The Club Leo forms will be in your children’s folders so you can pick and choose the books. Parents also have the option to order online at https://clubs2.scholastic.com/clubs/clubleo with the classroom activation code JRYQV. LAMB will receive bonus points for every purchase made, so we can get books for our library. Betsy will be taking the order forms for the Missouri Avenue facility and Melissa will do the same for Taylor Street. Forms are due by February 15th, so please make sure you submit your orders on time. If you have any questions feel free to contact Betsy at betsy@lambpcs.org. Congratulations to the first cohort of 12 LAMB parents who recently graduated from the Padres Comprometidos Program. In this six-week parent engagement program offered in partnership with the National Council de la Raza (NCLR), participants learned how to better promote the academic and social progress of their child. Many thanks to Martha Sanchez, LAMB parent, who co-facilitated the sessions. The second session of Padres Comprometidos will be offered at the Taylor facility. For more information about this program, contact Teresa Aspinwall, parent liaison, at 202-726-6200 or via email at Teresa@lambpcs.org. Join in the fun! The Sister School Group and the PTO are sponsoring this fun event for all LAMB families. The time: 6 to 8, the place: 1375 Missouri Avenue. There will be Latin/US dance music, a photo booth for you and your child/(s)/partner, heart cookies to decorate, a Salsa dance competition, fair trade cookies/chocolate to purchase, hearts and crafts, Latin food, valentine writing to sister school students, and MORE! Entrance cost (food is extra): $5 per person or $15 max per family. Food and drinks will be available for sale. All proceeds go to scholarships for our three scholarship recipients in Nicaragua. Come, have fun and help change a child's trajectory!